Summer is here! Friday was the last day of school for the kids in our neighborhood. We live across the street from the park and the kids are already out and about enjoying their summer vacation. Summer and ice cream go hand-in-hand if you ask me. I am so ready for ice cream season! We churned up a batch of 4 Ingredient Chocolate Cookies ‘n’ Cream Ice Cream to celebrate the start of summer. The recipe comes from my dear friend, Alice’s, new cookbook, Savory Sweet Life. Alice’s book is filled with 100 simple and delicious recipes that are perfect for any and every family occasion. And good news-we are giving away a copy today! Savory Sweet Life is one of those cookbooks that you can’t put down. 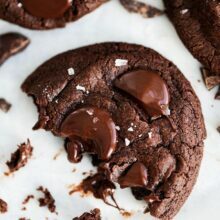 There is a photo for every single recipe and the photos are stunning. Warning-your stomach might growl at you while reading Alice’s book:) The book is organized by occasion, such as, Sunday mornings, Game Day, Potlucks, and Family Game Night. The recipes are easy to prepare and use basic ingredients that you probably already have in your kitchen. Alice also shares personal stories, time-saving tips, and practical advice. I love everything about the book! The first recipe I tried from Savory Sweet Life was Alice’s Chocolate Cookies ‘n’ Cream Ice Cream. It is amazing! Alice created the recipe for her daughter who is sensitive to dairy. Yep, this ice cream is dairy-free! I promise you will never know it! The ice cream is so rich and creamy. So what is the secret? Coconut milk! You blend coconut milk, sugar, and cocoa powder together and churn the mixture in an ice cream maker. You add the crushed Oreos during the last 5 minutes of churning and that’s it. So simple! I still can’t believe there are only 4 ingredients needed to create such a decadent ice cream. 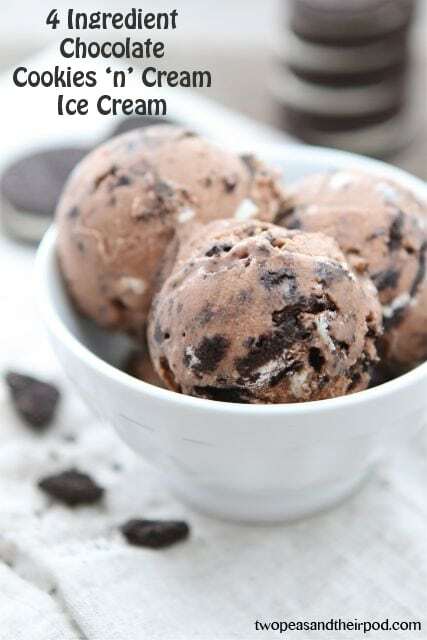 I know we are going to be making this 4 Ingredient Chocolate Cookies ‘n’ Cream Ice Cream ALL summer long. I can’t wait to cook and bake my way through Savory Sweet Life. I know it won’t be put back on our bookshelf for a long time. You only need 4 ingredients to make this decadent ice cream! Combine the coconut milk, sugar, and cocoa powder in a blender and blend for 20 seconds. Pour the liquid mixture into the bowl of an ice cream maker and churn according to the manufacturer's instructions. During the last 5 minutes of churning, add the crushed Oreos. Transfer the ice cream to a plastic container, cover, and freeze until ready to eat. Note-Alice recommends using Chaokoh brand coconut milk because of its high fat content. I can’t wait to break out my ice cream maker this summer…I’ve owned it for two years and not made a single thing, but this is going to change very soon! This looks amazing and I love that it’s so simple. Mmm… I love ice cream. We haven’t made it at home since we moved, but this makes me want to get out our ice cream maker. So excited about her book! Awesome giveaway! what you are looking forward to this summer? = longer days and summer fruit! I can’t wait to make more trips to the North Shore… there’s literally nothing better than a day at Waimea swimming, snorkeling and cliff jumping. Oh… and of course getting shave ice afterwards! Shorts, tank-tops, flip-flops, and sangria! Moving into my new house and breaking out the ice cream maker! My bestie just recently moved to Australia, and I am going to visit her this summer! Can’t wait to see my friend thousands of miles away! I always look forward to eating ice cream. This summer though my brother is expecting his first child. I am really looking forward to that. That ice cream looks incredible but can you tell me, does it have a strong coconut flavor? I’m really not a fan of coconut so I’m trying to imagine that flavor mixed with Oreos. And as for what I’m looking forward to… getting back home to Chicago to visit friends and family. I’m looking forward to a visit from my family over July 4th–hamburgers on the grill, homemade ice cream (my nephew thinks we should make four kinds), croquet, sparklers, old Disney movies. It doesn’t get better than that! I can’t wait to be FREE from school! Besides making this ice cream, I can’t wait to get my annual tan back! I’m looking forward to a vacation to Europe, family get togethers, and some anticipated down-time…. Looking forward to a week off from work for family vacation! For the summer, I’m looking forward to eating out on the back deck and enjoying great weather! I have some random weeks off from work this summer, so I’m really excited for those! In the summer I look forward to my birthday and the beach!!! I’m looking forward to slowing down, eating the tomatoes from our garden and hanging out with Big Daddy and MiniMe! I love how late it stays light out and eating dinner outside! I’m looking forward to warm weather, my garden, and boating on the lake. I’m looking forward to cold dessert and hot days! This summer I’m looking forward to hiking! I am looking forward to a less hectic schedule. Thanks for the opportunity! swimming… definitely during nap time, since that will be very relaxing! Grew up working on a fruit farm and I still go back every season for fresh blueberries, raspberries and peaches. To me, nothing’s better than picking a sun-ripened peach straight off the tree and biting into it; it’s not summer unless there’s peach juice dribbling down your arm! I bet the cocoa-based ice cream here will go great with some black raspberries in place of the cookie bits- but I do love Oreos just as much! Looking forward to building our new backyard patio! I’m looking forward to experimenting with the popsicle molds I picked up this winter! I’m excited for fresh tomatoes and basil! A move, a new home, a new job – I’m excited for a new start! this looks so easy, and yummy! I am looking forward to picnic lunches at the park this summer! I am looking forward to creating meals with fresh local produce. Playing with my children outside! I am looking forward to our family camping trip. I love spending time with or extended family. And this year my grandsons are coming! I am looking forward to sleeping later and lazier mornings! BREWER games!!!! Fun, Friends, Food! I’ll definitely be making this for my 4-year old, I know he’s going to love me for that, and you too for passing on the recipe. Thank you! BBQ’s outside and fresh corn on the cob! I am looking forward to many, MANY days at the beach (hopefully!). Also, I hope to find a decent Farmer’s Market somewhere close by. I’m looking forward to enjoying our fresh garden foods and campfires! I’m excited to get married 🙂 2 months away! This cookbook looks awesome!!! I look forward to the annual Fourth of July open house/BBQ/pool party that my family has each year. We see about 75 friends throughout the day and eat lots of good food. I can’t wait to go to the pool! I’m looking forward to spending time with my best friend who was overseas for the last two years!!! I just lost my job last week. So I am looking forward to spending the summer with my kids, for the first time ever…while looking for a new job, of course. I’m definitely looking forward to being off of work next week and going to the beach with my family! Summer is the time to enjoy long, lazy, simply delicious meals with friends under the setting sun!! Summer BBQ’s, working on the yard, hanging with the neighbors in the yards, the annual block party. So much to look forward to! I’m looking forward to our daughters first birthday celebration! I can’t wait for family crab-picking nights. Born and raised in Maryland, but currently living out of state, I revel in going back home and enjoying my home-state food! For summer, I can’t wait until hot sticky summer days spent relaxing at the pool! Looking forward to backpacking this summer! I am excited for some camping and hiking! I’m looking forward to flip flops! I am so excited for summer bbq’s. I love everything about summer. This ice cream looks delicious! Kids being out of school and family vacation. Spending time with my son while he still wants to be around his mom! He just turned 14….ugh. This summer I am looking forward to spending a lot of time with my young kiddos, swimming, riding bikes, making ice cream, and maybe even just relaxing a bit here and there. I can’t wait to try this recipe. I used coconut milk (for smoothies) for the first time last weekend, and oh my how good it was! Thank you for sharing! I looking forward to spending quality time with my daughter, she will be home from college soon! This book is on my list, it sounds wonderful! I am looking forward to moving into our new house this summer. We closed on it in April, and will finally get to move in July. finally building that tree house! I’m most looking forward to moving this summer! My husband and I are moving from NC to SC this summer, I’m so excited! I am looking forward to relaxing with family and friends! I’m looking forward to weekends at the beach! I’m looking forward to camping with our best friends. We’ll probably try to do a few trips with them over the summer. I’m looking forward to one last summer in New York with my high school (and post-college) best friends before we all go on to do very adult things: start full-time jobs, get married or, in my case, move to LA to attend grad school. How perfect! I actually just made coconut milk for the first time the other week and have some leftover in the freezer. I’m a sucker for anything with oreos! The thing I look forward to the most about summer is having my son home with me all day every day. I am looking forward to the beach! I can’t wait to try this recipe, my husband is allergic to milk too. Going out on the boat and weddings! When I was little, my mom started a tradition where once during the summer we would eat sweet corn and ice cream for dinner. It is still one of my favorite memories and I love sharing the tradition with my family. Fresh produce! I love veggies from our garden and CSA box. Summer time to me is easy get togethers, grilling great food and making as many custom flavors of ice cream as possible!! I can’t wait for my big move from Columbus OH to Indianapolis IN!! I love ice cream and my 6-year old is obsessed with snowcones. Hoping to convert her to rhe “healthier” options. My favorite thing about summer is Independence Day! I get all teary eyed every year hearing the patriotic music. My family does a big bbq & lots & lots of fireworks! I’m looking forward to summer Friday’s at work! We have a wealth of craft breweries in our area and I can’t wait to sample their latest concoctions while sitting out on their patios/decks after a day of hiking. I’m looking forward to wearing summer clothes, and going to the park! Looking forward to spending time with the grandchildren, eating waermelon, and going on vacation. I look forward to many things with summer here…less traffic on my commute to work, fresh fruit I can pick myself, longer days to enjoy life some when I get home, and taking some time off to spend with my wonderful husband and sweet dog! I’m looking forward to having some “me” time! More time for exercise and yes- vacation with my husband in August!! And this ice cream, of course. I’m looking forward to going to the beach! Thank you for the giveaway! Having dinners outside every night! Being a stay at home mom in summer is kind of a challenge. But I love finding fun stuff for my daughters to do. Bug hunting, sidewalk paint, homemade bubbles, so many possibilities!. They’re 5 and 2 and everything is still new and exciting. Bring on the summer! I am looking forward to strawberries and all the other fresh produce that begins to appear in farmers’ markets! I can’t wait to start my new job and move to an apartment witha kitchen I can actually use! I can’t wait to enjoy summer fruits and veggies, especially when eating outside! Can`t wait for the kids to be out of school and gardening my heart out, till the freezer busts open! I am looking forward to attacking my ever-growing book list! I plan on going to the beach this summer and doing A LOT of work on the house. And having lots of cookouts with family and friends! I’m looking forward to my veggie garden producing! I am looking forward to spending more time outside and enjoying the warm weather! Visits from kids are the best part of summer! I’m looking forward to our family vacation next month! We’re going to Kiawah Island. Sleeping in! As a teacher, this is what I look forward to each summer. My first grandchild is turning one in two weeks and has moved (with his parents, of course) from Toronto, Ontario to 90 miles away from me. I am planning on a Nana/Jarrett summer! Family trips, camping and grilling! What am I looking foward to this summer? Making this ice cream! YUM! I love summer grilling and icy cold beverages! We got off early on fridays at my office during summer months so that is what I am most looking forward to. I am looking forward to vacation at the beach with my family! I am looking forward to playing on the beach and eating ripe summer peaches! Eating ice cream and hanging out outside with friends! I’m looking forward to our family vacation at the end of the month (to visit family) the most. But also looking forward to day trips to the beach, picnics, and going out for ice cream/snow cones. I have an almost two year old and he makes summer even more fun! I am looking forward to family time and a new baby!! I’m looking forward to lots of playing and picnics at the park! My daughter is SO excited! Summer has so many possibilities! We are having lots of visitors this summer, so that will be fun. Ohh that ice cream looks Incredible ! Looking forward to shorts and flip flops, Sun shine and it already being warm when we get up in the morning ! Just a change in routine and fresh summer fruit ! Looking forward to days by the pool with my family and friends. I am looking forward to spending time with my kids. I’m looking forward to a lot of fun with my kids, but our big thing is going back “home” to visit family for 3 whole weeks! I’m a teacher, so I’m looking forward to not having to go into the college every day!!! I’m teaching an online class, but still…I get to stay home!!! I’m looking forward to playing outside with my boys every evening! Hiking! That ice cream looks amazing! Long, warm evenings and going to the beach! Thanks for the giveaway! I’m looking forward to baseball! We have the Klamath Falls Gems here to enjoy! I’m looking forward to our yearly trip to Colorado. Can’t wait to see those mountains and smell that pine smell! Just made this. It’s really easy and since my ice cream maker was already in the freezer I had homemade ice cream in 30 minutes! Probably not the last time I will make this! We are looking forward to our Seattle vacation and driving out there from WI and doing a little backpacking on the way! I am looking forward to lots of pool time! moving into our new house! obviously that’s not an annual thing to look forward to every year but this summer that’s what we’re most excited about! I’m looking so forward to our summer vacation to Tybee Island, GA. Looking forward to having my daughter home for the summer so we can play more and not having to rush around trying to get to bed on time so were not tired for school the next day! I’m looking forward to summer flowers. I’m really looking forward to spending a lot of time in the kitchen – working with doughs and breads more than I usually do, lots of homemade versions of things I usually buy at stores – I’m pretty excited! I am looking forward to beach days, tan skin, bbqs and fun summery treats! Oh yum all over this easy-to-make ice cream! Yum! This summer, I look forward to a lot of travel, HOT weather, and delicious cold beverages too cool me down! I’m most looking forward to having a fun time with my family – I’m starting to make a to-do list with my oldest of things she wants to do before school starts back up. I’m looking forward to some more homework-less weeks before I start my Masters program, and a family trip to DISNEYLAND! Yippeee! I am looking forward to making homemade ice cream and enjoying the warm weather. I am looking forward to so much this summer! Vacation to Riviera Maya, laying by the pool, beach trips, warm weather, ice cream… the list goes on and on! i like easy recipes – will be trying this one tonight! 🙂 looking forward to lots of pool time w/the toddler! Summer time with my two beautiful girls. I am looking forward to pool parties! Smores. Water balloon fights. Beach trips. And Ice Cream. lots of ice cream. Waiting for the warm sun. 50 and rainy here…blah! I’m looking forward to our week at the beach at the end of the summer! I am looking forward to being at home with my family! I’m looking forward to both my grown children graduating in August! Yum!! What a rich and delicious looking summer treat. I love the huge chunks of oreos!! My family is looking forward to the downtime and our vacation to the beach! I can’t wait to visit my friends and family back on the east coast! I’m looking forward to cook-0uts! Oh this recipe sounds right up my alley! I’m looking forward to making tons of ice cream again this summer–I made over a dozen batches of ice cream in just 2 months last summer! I’m looking forward to many summer barbeques!! I can’t wait to dig into my copy! This recipe looks awesome. Love that opening shot-makes me want to dig in! I am looking forward to attend the Hollywood Bowl every week in the summer. I’m looking forward to some lazy days by the lake! That ice cream looks delicious! This summer I’m looking forward to family vacation. This looks delicious! I’m looking forward to spending time outdoors with the kids and fresh tomatoes from the garden!!! Ooo! 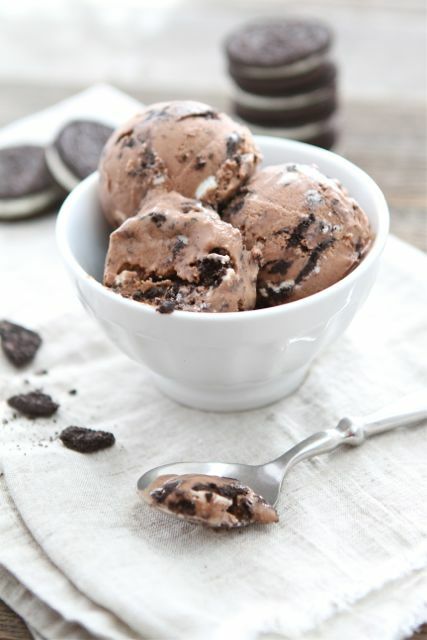 My boyfriend loves Oreos, so I’ll definitely be making this ice cream. I love summer because of the weather. Looking forward to spending days at the beach with my daughter. Staying up late and sleeping in! I’m looking forward to seeing my niece be Fair Queen. I’m looking forward to spending some time in nature! I can’t wait for hot weather and playing in the backyard with the kid. And eating ice cream… LOOOOOOTS of ice cream. I’m looking forward to playing outside with my little girls! I am looking forward to keeping my grandchildren and making homemade ice cream. Looking forward to family time and catching up! Time off would be nice, but I’m not sure I will get it. I’m looking forward to some sunshine, but our weather is not cooperating. Go away rain! I am looking forward to lots of great watermelons. We have a local farmer that produces several varieties and I love cold melon on a hot day. Great combination for the ice cream and I love that it only has four ingredients! I am most looking forward to enjoying our new neighborhood, including concerts, amazing restaurants, and the farmer’s market just a couple blocks away. I am looking forward to sipping Mojitos, visiting wine country and lots of beach volleyball this summer! I’m looking forward to more outside time, cooking with friends and family. I think I’m looking foward to Iced tea, and all the different varieties there are! I’m looking forward to cook outs and hanging by the river!! Maybe I should break out that ice cream maker I’ve had for almost THREE YEARS and never used!! I am looking forward to some time at the beach with some good friends! I am looking forward to slowing down the daily pace and not having to rush everywhere! Looking forward to fresh vegetables and growing herbs! I am looking forward to *hopefully* getting a teaching job for next school year! Can’t wait for summer when it gets here in Seattle – currently wearing sweaters and rainboots 🙂 Looking forward to watermelon, sun tea, basil, and peaches. I’m looking forward to spending more time with grandkids and bbq’s with friends and family. I look forward to my college boy being home and all of us being together again! I am looking forward to summer fruits coming out and making ice cream. Both go hand in hand! I’m looking forward to summer fruits and making ice cream! I am looking forward to the sun, not having to wear jackets at night bc its warm enough, and definitely ice cream and bbqs!!!!!!!!!! I’m looking forward to cooking with the herbs I planted! Sitting on our back porch in the evenings. We just go new patio furniture! I’m looking forward to visiting my family! I can’t wait to take my kids to the beach and pool! I’m looking forward to family visits and no rushing kids to school! I’m looking forward to eating ice cream, planting a garden, and having time to spend with the people I care about. I’m looking forward to my first baby girl after three of the cutest boys! I’m looking forward to being more active outside hiking, swimming and running. I’ve been looking forward to a trip to the Lake Michigan beach since winter! Time for sun and sand! I can’t wait to spend time with my kids (teenagers – so food is guaranteed family time ;). Love trying new recipes, especially those including fresh fruit and veggies during the summer. The kids love the dessert recipes – and will actually help with those! I’m looking forward to spending more time with kids and not having to work around crazy school schedules for a few months! I am most looking forward to spending time at the beach! I am looking forward to everything cold and sweet!!! Ice cream cones, frozen juice pops..you name it!! I’m absolutely looking forward to longer and lazier days!! A little late evening ice cream also sounds pretty amazing right now! Living in Seattle, this summer I’m looking forward to walking my dog every day in the sunshine vs. the rain! I am most looking forward to vacation! I can’t wait to get away for a long weekend! I am looking forward to days at the beach and visiting family this summer! This looks so yummy! I can’t wait to take my baby swimming this summer–he loves bathtime so I’m excited to take him to a really big bathtub! Wow, this looks easy. I’m looking forward to making this recipe for family that will be visiting. I am looking forward to doing absolutely nothing! I’m looking forward to family reunions, swimming in my mom’s pool, and spending a wk at the beach. Thanks for chance to win. I am looking forward to a Trip to Canada with my Man and a trip to SC to visit our families at the Beach! Busy JUne & July! I am looking forward to trying out my new ice cream maker…. I’ll try lots of new recipes this summer!!!!! I’m very much looking forward to picnics and barbecues and hopefully lots of time spent with my family and friends! Peaches, blueberries, and cherries. I always look forward to summer fruit and finding different ways to use them. This book is just what I need. Looking forward to nice weather and pool time! I am looking forward to spending time outside. I live in snow country but dread the cold so bring on the sun, the grill and camping! That ice cream sounds amazing, must try it! This summer I look forward to swimming (and winning that cookbook). i’m looking forward to summer fruits, bbq’s, summer clothes, and beautiful sunny days! I am looking forward to fresh fruits and cool evening breezes. 🙂 Thanks! Definitely our family vacation to Hilton Head Island. That looks awesome! This summer promises a return to swimming and kayaking finally! While no ocean here, we do have lots of lakes and ponds and rivers, so no excuses now. I’m so looking forward to a few day trips to the beach with my family. I’m looking forward to less schedules..
OH EM GEE! That ice cream looks delish, and who knew it uses coconut milk?! I’m definitely making this pronto! This summer I’m just looking forward to the warm weather and enjoying fires out in the back yard. Thanks for the giveaway! Looking forward to camping and lots of summer fruit and ice cream! yum! I’m looking forward to picnics at the park! I am looking forward to baking and cooking /grilling and making new friends. This ice cream recipe sounds really delish. Did you know (probably do) that you can make whipped cream with coconut milk? Warm weather and get togethers with friends and family. I can’t wait to go to the drive in movies with the family. It’s the best time of the year. BBQs with the kids and hubby outdoors in the backyard. I am looking forward to the long summer nights spent with my new husband in our new home! I’m looking forward to my family’s annual beach trip. It’s going to be the first time my husband gets to go. So excited! I am mostly looking forward to spending time with my sweet baby girl at the beach! We are so glad school is out so we can have some good summertime fun! Looking forward to some fun in the sun with the fam bam. Anything from summer vacations to trips to the park, or summertime bbqs. I can’t wait for Independence Day. My family always has a huge cookout with all of our relatives. So much fun!!! I am looking forward to the long summer days, and ice cream, of course! I am looking forward to lots of fun family times including our annual beach vacation! I’m looking forward to my four cake decorating classes this summer! Watching my son play baseball and my daughter play softball!! I’m looking forward to a vacation to Montreal with the husband. We leave Wednesday! I am looking forward to family reunions and vacations! I am looking forward to enjoying the beach with my family. Thanks for the chance to enter. This summer I’m most excited about traveling, going camping, grilling on the BBQ, and spending time with family. I’m looking forward to moving in to my first home and celebrating my 30th birthday! We love tying different flavors of ice cream…we have just recently started experimenting soooooo this looks YUMMY! We look forward every year to going to the beach w/ our family and our best friends family over the 4th of July and all the kids are around the same age and we do the same things there every summer and the kids just LOVE it soooo much! Going to Europe in 10 days!!! I am looking forward to enjoying lazy summer mornings together, a week @ the cottage, and seeing how our first-time vegetable garden grows. I’m looking forward to spending a week in Maine before going back to school!! I’m looking forward to being a full-time mom and visiting family. Summer plans- A LOT of paperwork for our Ethiopian adoption! We will be very busy, but it is going to be VERY worth it. I am looking forward to having a month off of school from mid July to mid August, and possibly taking a vacation during that time! I am excited to spend more time with my kiddos! I got a new ice cream maker for Mothers Day. Can’t wait to try this. I love coconut milk in smoothies so I’m sure I’d love it in this!! And oreos ARE my favorite store bought cookie! We’re looking forward to eating watermelon, grilling, time spent at the park and library! I am looking forward to having lots of BBQ’s with family and friends! I’m looking forward to being able to sleep in, and having time to relax, bake / cook, and hang out with friends! 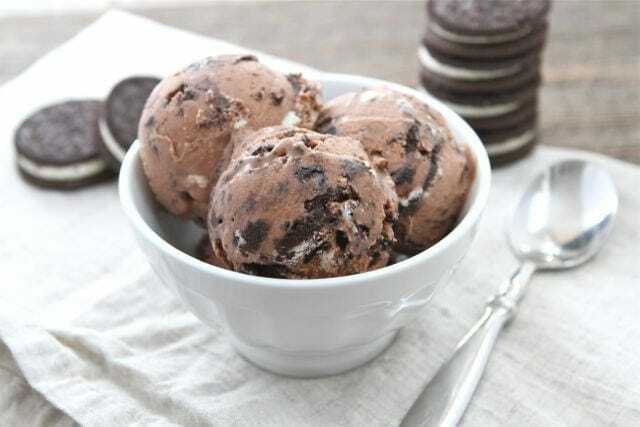 My brother loves cookies n cream ice cream, so we’ll definitely be trying this recipe out! Warm weather, sun and many a weekend spent hiking the trails in the beautiful mountains around our home! Im looking forward to going to the beach with my family! I’m looking forward to fresh summer fruit (love strawberries!) and vegetables!! I’m looking forward to our beach trip in July! I look forward to warm sunny days, fun in the water and dining outside on our porch! Summer is the best! I’m looking forward to family vacations!! Swimming and Ice Cream! My daughter is also dairy free, thanks for the great recipe! Looking forward to nice weather and outdoor parties! Can’t wait to take our little guy on many family adventures this summer including boating, the zoo, and some amusement parks! I’m looking forward to summer food with friends over! I’m looking forward to taking my two little ones to Germany to meet my extended family this summer and eating yummy German ice cream and chocolate! i love alice’s blog so i`m super excited for her book too! i `m looking forward to making tons and tons of ice cream over the summer since i just got an ice cream machine! I am looking forward to cooking because I will have a lot more freetime. Also I am looking forward to being out in the sunshine! I’m most looking forward to the longer hours of sunlight after work and some relaxation on vacation! I am looking forward to camping. And s’mores. Grilling! And time with family, both near and far. I am looking forward to being stress free and doing whatever my heart desires for 3 months. Making and eating LOTS of ice cream!!! being home for “a minimum of three weeks” … even if there’s a price to pay: hand surgery. I will be limited on what I can do, but other than when my son was born, I have never ever taken more than one week at a time off from work, in 25 years. Tomatoes! I love just picked tomatoes. Looking forward to sitting on a floatie in the pool with a cold drink in one hand & a good book in the other! The best part of summer is definitely swimming! I am looking forward to some time off to relax. I’m looking forward to serving on a medical mission trip to Haiti, as well as enjoying lots of yummy ice cream with my family and friends! I love the longer days… I hate when the sun sets at 4:30 during the winter. Swimming, summer movies with the kids, and laid back days! I’m looking forward to moving into a new house and the sunshine! I can’t wait to make s’mores! I am looking forward to making fresh homemade popsicles, and of course hanging with family! have a great summer! meals with fresh local produce. If I had an ice cream maker I would dive into this recipe! Can’t wait to swim everyday and my vegetable garden to produce! Hmm…I looove ice cream, especially chocolate. 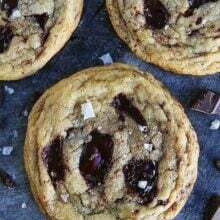 I will be trying this cookie combination soon. Looks fantastic! This summer, I’m looking forward to trying new things and getting creative as I try to accommodate a smaller budget! Most of all I am looking forward to enjoying my first big veggie garden! 10 tomato plants, 8 bell peppers, 3 rows of beans, 4 rows of squash, (yellow and zuch), radishes, carrots, sweet banana peppers. Plus a small herb garden. I’m so excited!! We love ice cream this recipe will be a hit for sure. Thanks for sharing! I’m looking forward to all the fresh summer fruit that’s started appearing! I can’t wait for summer veggies to grow in the garden!! I detest summer because I truly cannot stand hot weather, but there are certain summery things I enjoy. My two favorites would have to be watermelons, which my husb and I plow through at a rate of one or two per week, and being able to ride my bike after it has been confined to the garage all winter. I am looking forward to going to the Outer Banks for the first time! I’m looking forward to going on lots of walks with my cute little boys! We are looking forward to the birth of our first baby in 13 days or less!!! Eeeeek! enjoying time with kids with no pressure of school! Definitely looking forward to a family vacation! 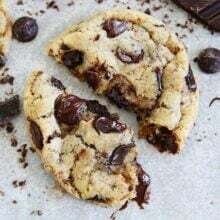 chocolate and more chocolate–my kind of dessert! I am looking forward to the nice weather and delicious, local, fresh produce! Grr now I need to buy an ice cream maker! I am looking forward to long sunny walks! I am looking forward to doing nothing…sleep-in, bake cookies, and just hanging out. This summer, I am looking forward to tubing down the West River! And then enjoying some homemade Chocolate Cookie ‘n Cream ice cream! I’m looking forward to getting out the grill and enjoying warm summer evenings with family and friends. Summer is blue skies, farmers market, laughter of happy children and no doubt – Ice Cream!! I look forward to the 4th of July every summer! I’m looking forward to weekends camping with my friends and family, a nice roaring bonfire, smores, grilling, fireworks, the 4th of July, my and my husband’s birthdays, and SWIMMING!!! I’m looking forward to not having to teach! I’m so worn out that ice cream making sounds delightful! I would live to try my hand at some of these recipes! I am looking forward to our family vacation – we’re taking a tour of D.C., North Carolina, and Tennessee! That looks delicious! I’m looking forward to spending time with family and summer road races. I’m looking forward to our family beach vacation in July on the North Carolina coast! Being pregnant and getting ready for our first baby! I am also looking forward to a family reunion in Florida! Chick Fil A’s Banana Pudding Milkshakes! Being out of school and reading books I actually like! I am looking forward to berry picking and jam making! I’m looking forward to the beach, sun, long walks with my dog, bike rides and spending time with friends and family outside! I’m looking forward to family time:) My husband works overseas and we only see him every 3 months . . .so each vacation is precious! We will do whatever we can squeeze into a 2 week time period. Traveling, cooking, swimming, and good ol’ family time. The beach and snow cones! this summer i am most looking forward to my trip to CAIRO, EGYPT! I am looking forward to having a week and a half off from work at the end of this month, & also spending more time with family & friends. Looking forward to reading at the beach…sun on my face and my toes in the sand! I’ve always wondered whether coconut milk could be churned into ice cream. This looks like such a fun treat! Oh my goodness, I’m going to have to try making this ice cream this weekend–I had no idea you could use coconut milk! This sounds fabulous! We joined a swim club this summer so we could take our 5-year old swimming, so that’s top on my list of summer fun! 1. I live in beautiful Charleston, SC just 20 minutes from several beaches! 2. My fiance and I just moved out of our first apartment and into a spacious house! 3. In June we’re having an engagement party, celebrating my nieces 7th birthday and my 23rd birthday! This summer I am looking to buy my first home! It’s a big milestone in life and I am so excited! Looking forward to many visitors over the summer and spending 2 weeks in Michigan for my brother’s wedding. I am looking forward to farmer’s markets! To me summer means lots of fresh basil!! That looks divine! Just went to buy coconut milk. I’m looking forward to swimming, but most of all our trip to Washington, DC. 13 yr old son was nominated for Jr. Nat Young Leaders Conference. This cookbook would be amazing! I definitely want this book – thanks for the chance! I’m mostly looking forward to summer for the longer days, warm sunshine, and more relaxed pace. I’m looking forward to a few small trips, zoo visits, staycation and homemade popsicles! Thanks for the giveaway! I’m looking forward to a family cruise!! I am looking forward to hearing some of my favorite music while enjoying the summer weather! I am looking forward to the longer days, and just the simple things of summer…..like homemade ice cream, swimming, and backyard parties with friends! We sat down with our 5 year old son and made a “summer bucket list”….and his list consisted of such simple things…..and now with our list, we will make sure to spend our summer checking them off!! Can’t wait to try this recipe! Farmers Markets, camping, and trips to the hot springs! Swimming and eating lots and lots of ice cream! today was my first day at the pool and it felt great! I don’t own an I’ve cream maker but this post makes me want to get one! Besides beginning to make ice cream, I can’t wait for ripe tomatoes, watermelon & sweet corn this summer. This is my favorite culinary season! I love that this uses coconut milk instead of cream! Do you need to chill the mixture before pouring it into your ice cream maker? I’m looking forward to tons of tomatoes from my garden and enjoying time with my kids. Thanks for the chance to win Alice’s awesome cookbook! I’m looking forward to my beautiful daughter’s wedding and to gaining a bonus son. I love them both so much! And I’m looking forward to eating juicy fruit while at the beach! This is what I made so far out of the cookbook too! Her book is so beautiful! I can’t wait for popsicles and playing with my kids. I am looking forward to peaches and bing cherries. I wait all winter for my favorite fruits. We just got a blender. So I am anxious to try making smoothies, milkshakes, frozen drinks you name it! I love that you posted about chocolate ice cream with oreos. Let me tell you, that is my blizzard of choice at DQ. I look forward to making my own version at home! My favorite things of summer– family bbqs, kids running through the sprinkler, garden goodies, and home made ice cream! Watermelon and longer days are about the main things I like about summer – it is much too hot for me in Georgia where we live, so I basically count the days until fall! I am looking forward to a trip to Alaska and the start of my year long sabbatical!! looking forward to my daughter being home after her first year in college! we have lots of cooking projects planned! We are looking forward to picking berries, swimming, going to the beach, taking my 3 kids and husband for their first time to Disneyland and Sea World. I am looking forward to more hours of daylight and spending time with friends and family. I’m looking forward to BBQ’s, warm weather and eating all the yummy summer fruits! Summer in Maui is just slightly more delightful than every other season…but there are definitely more visitors around. Always looking forward to being near the beach from sunrise to sunset! I’m looking forward to our family vacation. I’m looking forward to summer fruits like watermelon, water fights, more time to bake and periodic trips to amusement parks. I am looking forward to eating Indian Taco, Roasted Iroquois Corn Cornbread, and Bear Sausage at the Ganondagan Native American Dance and Music Festival July 28-29, 2012, in Victor, NY! I am SUPER excited for this particular summer to go very slow. My husband just got promoted and I can now be a SAHM. I am baking my way through some flour an making bread for all of our family an friends to celebrate. Plus my daughter is 18 months old, so this is going to be the summer I have dreamed of for over 10 years. Stay at home, be a mom, and cook!!! Cookies ‘n’ cream ice cream is my favourite flavour! I’m definitely going to make this once Summer arrives. Spending time with my brother and his family when they come for a visit in July. Riding ponies and horses with my friends! I am looking forward to not getting up at 5:30! Last day of school today!!! I always get intimidated by a long list of ingredients and steps the recipes usually have but this one sounds like a perfect one for a novice like me. I am looking forward to spending time with my BF. He works nonstop during the rest of the year. Also, kayaking with my family. I’m looking forward to spending every Sun afternoon at our friend’s pool! That cookbook looks fabulous! Thanks for the chance to win and for all of the inspiration you give us every day! I am looking to a little bit less chaotic schedule… crossing my fingers! I am MOST looking forward to learning how to use the grill more and eating lots of delicious veggies on the grill. Yum! I’m looking forward to shortened hours at work and more time spent outdoors! I can’t wait to swim and relax on the beach this summer! I’m looking forward to encoding the AZ heat and heading to visit family in Idaho! This looks delicious! I’m excited to go to the pool a lot this summer as well as try yummy new recipes like this one. I’m looking forward to seeing my boyfriend more often b/c we are long distance and he’s a teacher! Thanks! I’m looking forward to spending time outside. My goal is to do something outside everyday and to get to the beach (45 min drive) once a week after work just to sit and listen to the waves and unwind. I love everything about summer. We cook outside more and have lots of family get togethers. The kids love homemade ice cream, grilled hot dogs, and swimming. I love the sun and the summer time rains that make the dirt smell fresh. I am most looking forward to sharing some time with my 25 year old daughter who is coming home for the summer! She is my “cookies and cream”! I’m looking forward to a more relaxing schedule. summer fruit! bought my first watermelon of the season last night…so yummy! I look forward to summer produce and more daylight to spend with my friends and loved ones (dog included). Looking forward to working out and getting fit in a sunny Texas summer. Trying to get out in my garden with newborn twins and a 2 1/2 yr old on tow! What I am most looking forward to this summer is the summer food festivals. I am looking forward to a short stint to Yellowstone with the family and getting away for a few days! I am looking forward to spending more time with family, watching fireworks on the 4th of July, BBQ’s, swimming, picnics, outdoor concerts, summer reading and of course, making ice-cream. I’m looking forward to swimming again. I just had a baby so I won’t feel like a floatations device anymore! I am looking forward to mother daughter fun time and family vacation. I am looking forward to crafting, cooking more, and going to Disney World with my nieces!! Yum! I got an ice cream maker for Mother’s Day this year so I am so excited about experimenting all summer long. I’ve already tried a few and am loving the results! BASEBALL & ice cream of course!! I am looking forward to outdoor adventures with my son! Beach, Beach & more Beach!! This seems simply delicious! Honestly, the thing I am looking forward to do most this summer is obtaining a job. I recently graduated from college, and I’m having a frustratingly difficult time finding a full-time job…Making 4 ingredient ice cream will just have to tide me over, for now! I am excited for fresh fruits and veggies- especially tomatoes, corn and blueberries. Family vacation the week of July 4th!! We are looking forward to swimming this summer. And after your post I think some homemade ice cream! So excited to be home with my boys. I’m a teacher! amazing…simply amazing! yum! thanks for sharing! I’m most excited to have my kids out of school! They still have school until the end of June! No more school & no more homework for my kiddos! Pool time here we come! I am most ecxited to make my first trip to Maine!! Oh and how could I forget making this ice cream!! Summer fruit and long walks in the evening! This past weekend was a perfect summer weekend – boat rides (with tubing and wakeboarding), bonfire with s’mores, rock climbing, and plenty of time playing at the beach with friends. I hope the rest of summer contains more of the same! Summer means large family BBQ’s and lots of excuses to bake and enjoy the outdoors!! My husband just started a new job a few hours away. He started on Monday, but I won’t be moving for another month. I cannot wait to join my husband in our new home permanently!! I’m looking forward to lazy days in the shade reading a good book and eating lots of ice cream!! I can’t wait to see my nieces and other relatives on our road trip. Trips to the beach, time to relax, and plenty of margaritas! I am looking forward to the heat! I live in South Texas, where, yes, I suppose it’s always hot, but I love wearing shorts, tank tops, flip flops, and dresses! I am looking forward to Vacation.. reading a good book on the beach! That ice cream makes me wish I had an ice cream maker. I may need to get one of those this summer! Summer means seeing my sister, which only happens once a year — so I am looking forward to some quality sister-time! Great sounding cookbook. First and most important thing this summer is to head to Washington, DC. in a couple weeks to welcome the arrival of grandbaby #9….daughter, Lisa’s, first baby. I am giddy with excitment!! I’m looking forward to being off from school (took my last exam today! ), swimming, doing lots of projects I’m planning, and going to Seattle. Oh, and of course ice cream! My wife’s homemade bittersweet chocolate ice cream. Looking forward to my very first girls only, no kids trip to Vegas! I have 3 beautiful daughters, a wonderful husband and some great kids in my in-home daycare but this lady is ready for some me time! I am looking forward to seeing my family this summer! This summer, I’m looking forward to FINALLY getting a honeymoon with my husband! We were married last year, but with his med school schedule and my new job, we weren’t able to take a honeymoon. We’re going in two weeks as soon as he takes his med school board exam! Mexico, here we come! I’m looking forward to vine-ripened tomatoes! I’m looking forward to not having to be on a schedule all of the time. wow! That ice cream makes me want to get an ice cream maker!!! I’m looking forward to having a baby this summer. I may need some ice cream to cool me down. I am looking forward to so much as my life is being completely flipped this summer. I’m moving into a new apartment with a new roommate, starting a new school for a new career while working a new job, and getting into a new diet and exercise regime that includes a little time spent reading in the pool. It’s a lot of change, but in a super good way. This ice cream will just push it over the top. Yum! I’m looking forward to the sound of cicadas! We just enjoy the long, easy, relaxed days full of ice cream cones, swimming pools, and fresh vegetables from our garden. Thank you so much. I’m headed to Montreal along with a friend for 10 days of spectacular scenery, great museums, wonderful food and non-Texas heat. We’re already being blasted with 90+ degrees. Our wonderful meant to be cabin we just purchased and many weekends at the lake there! I am actually looking forward to making homemade ice cream so I am glad to see this recipe! I got an ice cream maker for Christmas and haven’t used it yet. I love homemade ice cream! Our daughter gets married this July. Will be a beautiful day and wedding. I am looking forward to fresh vegetables from the local farm stand! Going to Bear Lake! It isn’t summer until I’ve been there. Watching our tomatoes and herbs grow with my two-year-old granddaughter and teaching her about food and family and fun! We love to make bread, and have a new ice cream maker on order so ice cream is on the agenda! I look forward to keeping active with my family and all the sports that we play. Fresh herbs from my garden and a kitchen remodel at the end of summer! I love camping in moutains and eating food cooked on the fire or dutch oven! I’m looking forward to homemade ice cream, BBQ’s and watermelon! I look forward to going to our local lake and camping! Great family memories there. Oh my gosh I would so love this ice cream right about now. Any ice cream with Oreos is a winner in my book! I wanna eat this ice cream soon, thanks for the providing recipe. I am not getting late to make this ice cream. LOOOOOOOOOOOOOONG days where it doesn’t get dark until 9pm! I am looking forward to time hopefully slowing down. We have 4 beautiful children and time seems to be racing past me at the speed of lightening. I just hope to slow it down a little this summer…to enjoy each moment with each child. I am looking forward to catching up on things! And a nice vacation. Flip Flops, plenty of sunshine, outdoor concerts, road trips with the top off the Jeep, and Lots and lots of ice cream! Maria- this ice cream is just gorgeous! I also can’t believe it is only 4 ingredients! I have never made ice cream with coconut milk, but I look forward to trying this summer! I’m looking forward to starting my surgical rotation for my 3rd year of med school…. and the few hours I’ll have out in the sunshine! I am most looking forward to my first sun ripened tomato – heaven! This looks so decadent! I am so looking forward to only working one job and spending quality time with my husband, which will include lots of homemade meals! I am looking forward to our beach trip this weekend! This summer, I am looking forward to getting ready for my wedding which will be in the fall! I’m definitely looking forward to spending as much time outside as I can this summer. Yum, makes me wish I had an ice cream maker! I am looking forward to camping this summer! It’s been years since we have been camping and we have two trips planned this summer, can’t wait! My kids can not wait to make Smores this summer. I’m most excited about getting married this summer and whipping up some of these recipes for my new bride! I am really looking forward to spending quality time with my hubby and our 4 children!! I love summer holidays! I’m looking forward to the neighborhood sponsored outdoor movies across the street from my house, every Wednesday. Week 3 tonight! I can’t wait for my grandkids to visit. Yum! I love this! With the temperature rising, this is perfect! I’m excited for summer sunshine! and barbeques! and the beach! im excited for sunshine and freckles. I am looking forward to spending days at the beach with my family and having tons of cookouts! This looks fantastic! I absolutely love coconut. This summer… a break from studying! Plus I get to spend my first summer on the coast, so have all sorts of adventures up my sleeve. I can’t wait to relax by the pool and read a good book! I can’t wait to start making ice cream. I bought my first ice cream maker, but have yet to use it. Maybe I will try this recipe! I look forward to cook-outs and bonfires with family and friends! The beach, the pool, my sister’s wedding… Just love the summer! I am looking forward to the beach! I’m looking forward to some good beach time! Looks amazing 🙂 The book sounds incredible, can’t wait to try this recipe! I look forward to enjoying lots of time outdoors with my family. I’m looking forward to playing with the boys in our pool! I am so looking forward to traveling and some warm weather. The weather has been so beautiful in the DMV lately. the opening of our local farmers market! A trip to visit my Son in NYC! Looking forward to trying this ice cream. Seeing my family! I’ve been away from home for work and will get to go home for a few weeks! I’m looking forward to our trip to Washington, DC. We’re looking forward to grilling out and sleeping in! This summer I look forward to being outside with my grandkids. They would stay outside 24/7 if possible. I made a summer goal this year to make 10 kinds of ice cream. Here’s hoping I can follow through! Swimming and basking in the sun is the best thing ever about summer!!! O and the flowers! I’m looking forward to grilling tasty foods and enjoying the sunshine! Swim, walk, and enjoy the extra bit of daylight! I’m looking forward to lazy days and sunshine! I can’t wait to start making jams with summer berries! Thanks for the giveaway! I’m looking forward to late mornings and my boys learning to ride without their training wheels! We just signed our girls (8 and 10) up for swim team. I am excited to see how well my youngest progresses in her swimming and I hope she enjoys it as much as her sister did/does! I’m looking forward to eating lots of watermelon and mangoes, and going to the beach! laying in the hammock smelling the chicken on the grill and listening to the sound of icecream churning in the old fashioned ice cream maker. Visiting my family, whom I haven’t seen in ages! Summer gardening…home grown tomatoes…Bbq’s… Yea summer !!! I’m excited for laying by the pool! Thank you for the easy ice cream recipe! I really appreciate it. It inspired me to buy an ice cream maker yesterday!I already tried another recipe on your blog. The banana, peanut butter ice cream. My 4 year old daughter liked it so much, asked me to make more! This summer I’m looking forward to spending time with all my family. My family just moved back to the Midwest from the West Coast to be closer to my parents, sisters and their kids. It’s going to be an amazing summer! I can’t wait to try this recipe – it’s the perfect excuse to buy that ice cream maker that I’ve been wanting! Exploring the outdoors with my toddler, so exciting to see everything through his eyes. That and all the wonderful summer produce, u-picks, farmers markets, etc. I get to catch up with my best friend in lovely Las Vegas in two weeks! 🙂 We will definitely be enjoying some ice cream like always. Looking forward to my first summer as a college graduate! I look forward to being an empty nester for the first time all summer! Can’t wait to enjoy summer with my hubby of 28 years. Now we can cook and grill OUR favorite foods and not have to fight for the car. I am looking forward to long walks in the wam weather this summer, with my husband . Summer berries… strawberries, raspberries, blueberries, etc. I love everything about summer. Making ice cream, trips to the zoo, family time and vacations. I can’t wait. Excited to grill out each and every day! I am making this ice cream RIGHT NOW! I can’t wait. My kiddos aren’t out of school until next week, but I can’t wait to be able to sleep in with them and have breakfasts together without rushing around, yay!!! I’m looking forward to going on a road trip in August with my friends along the Pacific Coast Highway. Homemade Strawberry Pie and Ice Cream! I’m looking forward to taking the NY Bar this summer so I can finally stop stressing out! But for a summer-y activity … I’m most looking forward to barbecues and getting together with family. I look forward to seeing some sunshine, it was actually pouring rain yesterday! And with sun, comes BBQs on the deck. So excited for that! I look forward to cooking/baking with my daughter before she heads off to college in August. We haven’t cooked too much together but she is now really interested in being in the kitchen and I want to get in as much cooking/baking as possible! I look forward to being able to use a lot of basil (via my garden), eating fruits – especially watermelon and berries, hiking and reading out in the sun. The swimming pool! Except it might be interesting now that I have a toddler and an infant to keep track of. I’m most looking forward to spending time with my family this summer! I’ve been living in another country for the last two years so being with the people I love is a gift! I’m looking forward to swimming with my Grandkids, and having picnics! 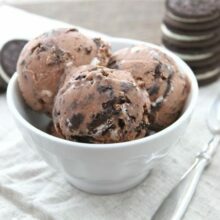 Just made this chocolate cookies and cream “ice cream”, and it’s very rich and decadent! It still tastes quite coco-nutty though, and I’m thinking of a pina colada adaptation with pineapple tidbits, maraschino cherries and some toasted coconut! I look forward to sitting out on my back deck and listening to all the birds singing. I really need a getaway! I am looking forward to more pool time with my nieces! I am looking forward to lots of sunshine!!! We have had two weeks of rain, drizzle and fog. I am dreaming of sunny afternoons on my deck!!! p.s. Thank you for including Canadians in your contests!! 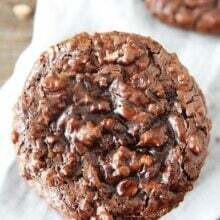 Can’t wait to try this recipe as chocolate should be one of the major food groups! We’ve already gone on our family vacation to the NC coast, but there are projects awaiting in the house…and yard! Looks like we’ll have a busy summer! I am looking forward to the amazing fresh fruits and veggies of summer! And my husband getting home from Army officer training in July! Love it! Will make some SOON 🙂 and Pinned! Have a great weekend Maria. I am looking to some time off and a road trip from California to Utah. I’m looking forward to our family reunion…everyone is coming this year! I just finished cleaning (and putting replacement parts) on my still-wonderful Weber Genesis grill. I can’t wait for the first barbeque of the season! I need to re-invest in an ice cream maker. Sounds soo good! I’m looking forward to summer because I’m a teacher! Even though I tutor during July and August, I get to kick back and relax and paint. Eating a lot of ice cream! I can’t wait for no school and having my kids home all day! summer is family time and canning all the in season produce, veggies so we can have fresh summer fruit and veggies during the winter. I am sooo looking forward to a week with 6 other families in a Victorian mansion in Lake George, NY. We are all parents of a child with Down syndrome and we live all across the United States. We’ve become the best of friends and we travel together a few times a year. So this summer there will be 12 adults and 11 kids (7 with Down syndrome) enjoying a week of swimming, boating, cooking on the grill, enjoying adult beverages in the evening, and just having a great time!! This summer, I can’t wait for hot summer days and cold treats! I’ll be finishing up my graduate program in two weeks and then it’s summer vacation, full of trying new recipes, getting in shape and enjoying the family! I am currently studying abroad but normally live in the States– I hope I count as I would love this cook book being a new wifey! 🙂 I am looking forward to lots of beach days and ice cream of course! I’m looking forward to a few days vacation in the NC mountains, cooking out on the grill, and enjoying my flower garden. This summer I’m most looking forward to homemade ice cream, backyard firepits (S’mmmores:), roadtrips, and meeting my new little niece, Nora. I’m looking forward to summer fruits and veggies, and time with family! I’m looking forward to spending time with my family at the beach! Looking forward to family vacation and going to visit my family in NY. I am looking forward to spending as much time with my two daughters before they both fly out of the nest, one to college, and one to grad school. I am ready for strawberry and rhubarb desserts! I am looking forward to sleeping in… no lesson plans… no grading papers… and spending more time in my kitchen and garden. I’m looking forward to running in beautiful warm mornings and enjoying BBQs in the evening. That cookies and cream ice cream is looking so good! Lazy days. thunderstorms. hammocks. fresh vegetables from the garden. most though I am eagerly awaiting vacation time spent with my hubby! I am looking forward to Blueberry picking at my friends farm in Ohio!!!! I made this the other day to test my new ice cream attachment and it was delicious. Super easy and super tasty, we almost ate when it came out of the ice cream machine. I will definitely make it again and really soon. Have you tried making it without the cocoa? This looks really good! How long should the ice cream chill? I haven’t tried it with any other milk. Let me know if you try it! I’m so looking forward to watching my herb seeds emerge through the soil, especially the mint I will simmer gently in sugar and water. It will refresh my icey cold tea on a hot summers afternoon. Work! Work! And more work! Unfortunately, have to work 2 jobs and can’t afford a holiday or the time off. Haven’t even received any invitations to cottages for long weekends in a decade … which okay when the weather’s rainy … but really saddening when it’s hot and sunny. Thanks so much for this awesome ice cream recipe! I have made it twice, one time for my husband and I and another time for a group of friends. Both times it turned out great and everyone loved it. I have a hard time with diary but with this recipe I don’t even miss it! body that you would use to order a coffee. Another thimg to look for company’s manufacturing bags. in the average Christmas gift buying price area. I make ice cream year round and have wanted to try with coconut milk and think I just found the recipe to try it with! I am most looking forward to summer so I can be barefoot and eat meals with ingredients fresh from my garden and would love a new cookbook to try!!! I am looking forward to spending fun days with my two boys. I love homemade ice cream. This sounds so yummy!! Can not wait to try it! Looking forward to getting out on my motorcycle on the weekends…..sunshine and open roads. I’m most looking forward to a much needed beach vacation! I look forward to family time, which will probably include eating ice cream. I look forward to the local farmers markets and cooking fresh, healthy, delicious meals for my family and friends. I’m also looking forward to my young daughter watching her vegetable garden grow and have her eat and cook with her own produce. Holy cow, thanks very much for posting this! I found a delightful Green Tea Ice Cream Recipe. You should really check it out, it was easy! mouthwatering! My children being able to go on adventures. Finally got around to making this ice cream. I loved it! Especially with whip cream. Thanks so much for sharing! Hi – Is it possible to make this into a “no churn” treat?